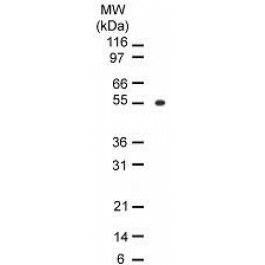 Mouse anti Human Osteoprotegerin / TNFRSF11B 98A1071. Product is tested for Frozen Sections, Immunocytochemistry/Immunofluorescence, Immunoprecipitation, Paraffin Sections, Western blot / Immunoblot. 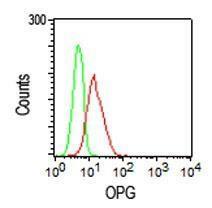 A peptide corresponding to the amino acids 20-37 TQETFPPKYLHYDEETSH of human Osteoprotegerin was used as immunogen for this antibody. Osteoprotegerin (OPG) is a secretory glycoprotein belonging to TNF receptor (TNFR) superfamily. As the me implies, it protects bone. Unlike other TNFRs it lacks a transmembrane domain and lacks any apparent cell associated sigls. OPG consists of 401 amino acid with molecular mass of approximately 55 kD as a monomer and 110 kD as a disulfide-linked dimer. 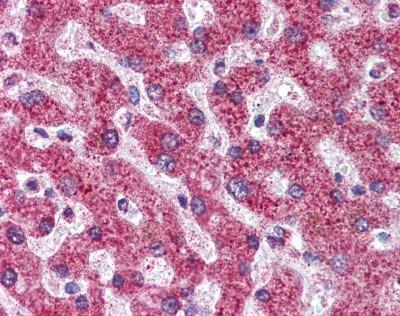 High levels of OPG mR has been detected in lung, heart, kidney, and placenta1. Recombint OPG blocks osteoclastogenesis in vitro and increases bone density in vivo. Targeted deletion of OPG in mice results in severe early-onset of osteoporosity. 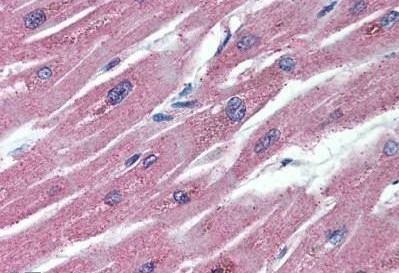 These mice also exhibit increase in vascular calcification in the aorta and rel arteries suggesting that it may also play a role in degenerative arterial disease. PBS containing 0.05% BSA, 0.05% Sodium Azide. Store at 4C short term. Aliquot and store at -20C long term. Avoid freeze-thaw cycles.